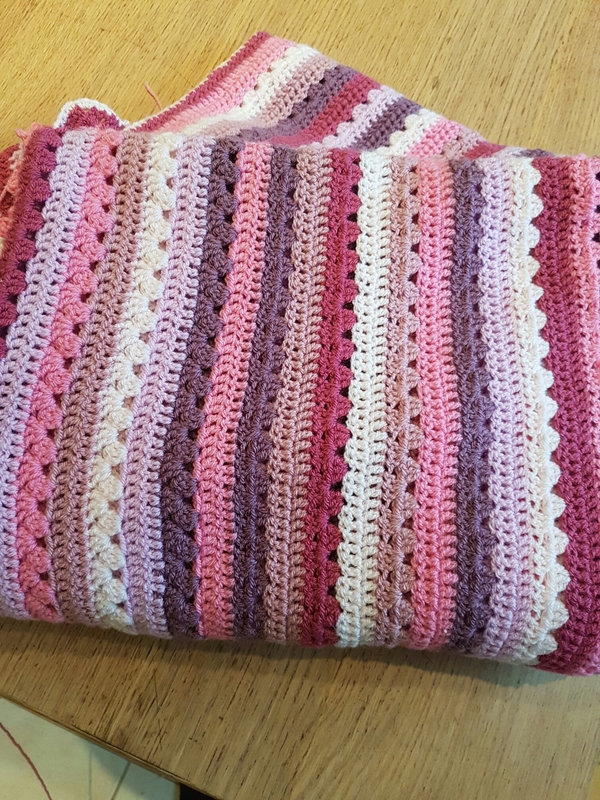 Cosy stripe blanket with flower border. 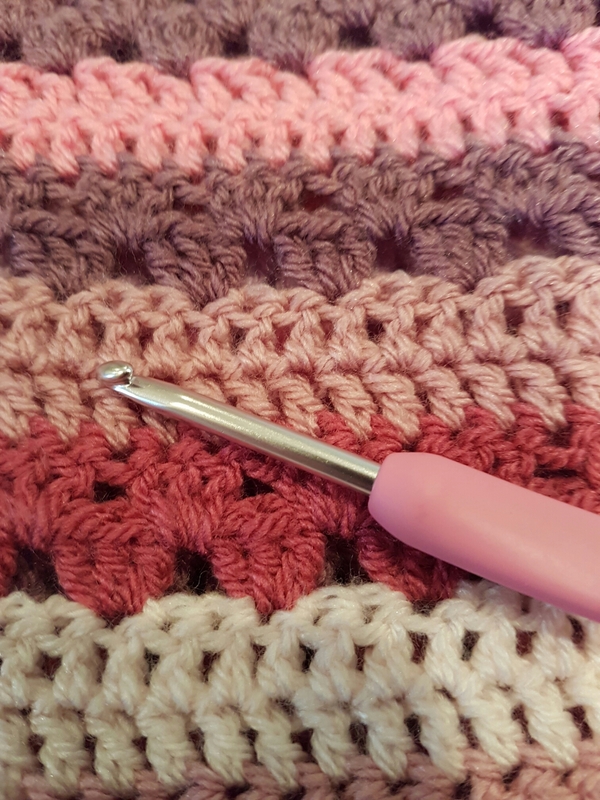 – That DARN Crochet! 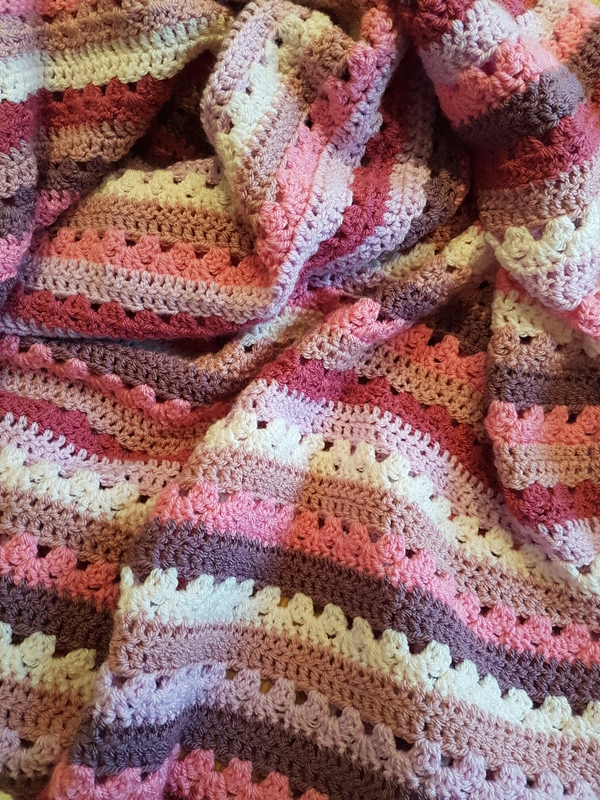 I made it single bed sized (120cm × 180cm) and used the Attic 24 cosy stripe blanket pattern by Lucy. I selected the colours by randomly selecting them out of the six until I had used all six and then starting again. So it’s random but kind of evenly spread. Flower border pattern on YouTube. 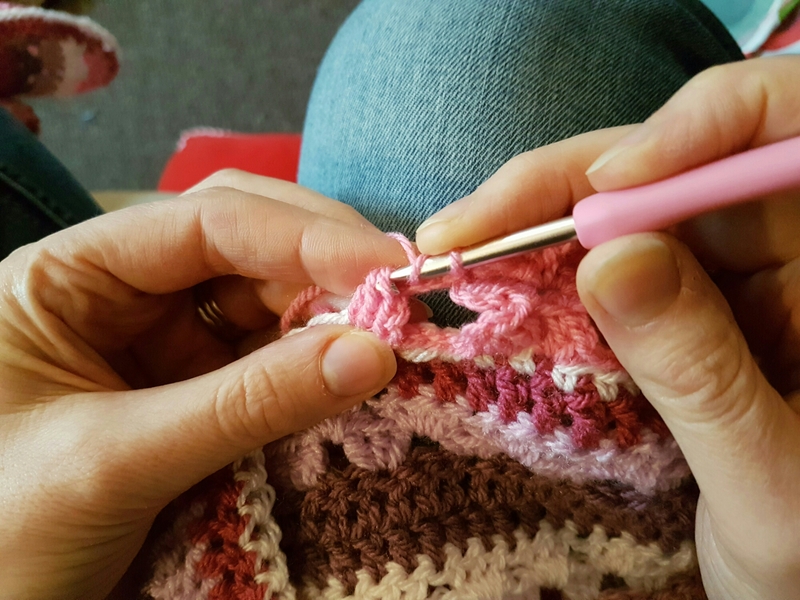 I started it and made three or four flowers along the edge of the blanket but found that once made it was too floppy, the large flowers were too far away from the blanket and being connected by just the chains I was concerned they wouldn’t stand up to the use and abuse our blankets go through. 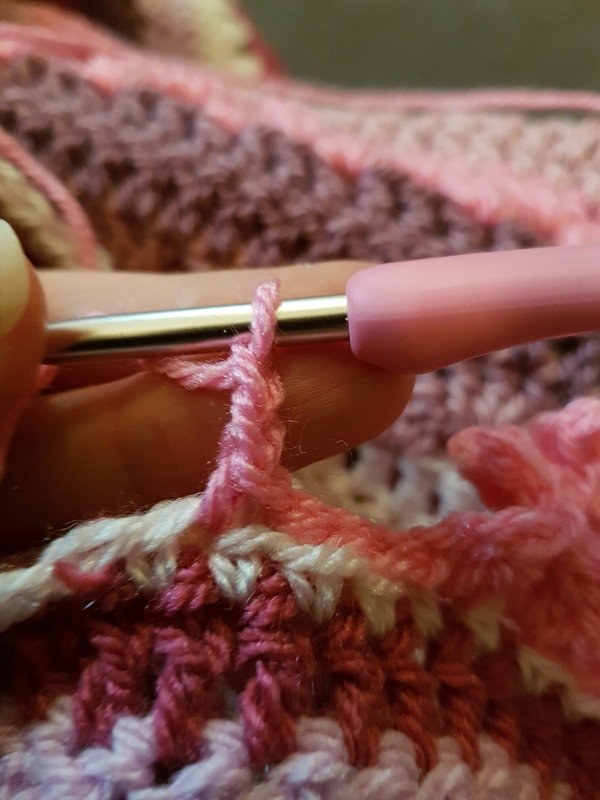 But I had a devil of a job trying to pull my loop through 33 loops on my hook plus I had to dump my beloved Etimo hook for a simple metal one since there wasn’t enough room for all the stitches on the shaft of the hook. 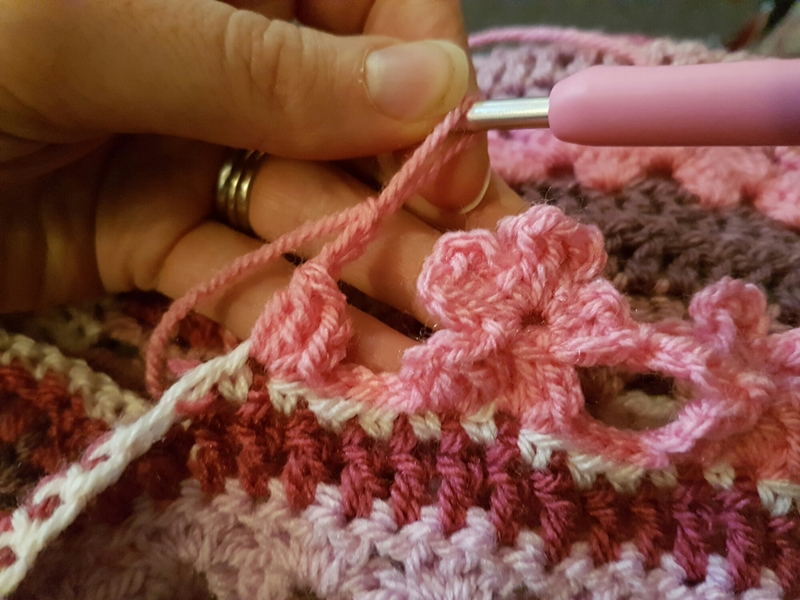 I didn’t fancy making 500 odd puff stitch flowers with only a metal hook for company. I’m spoiled. 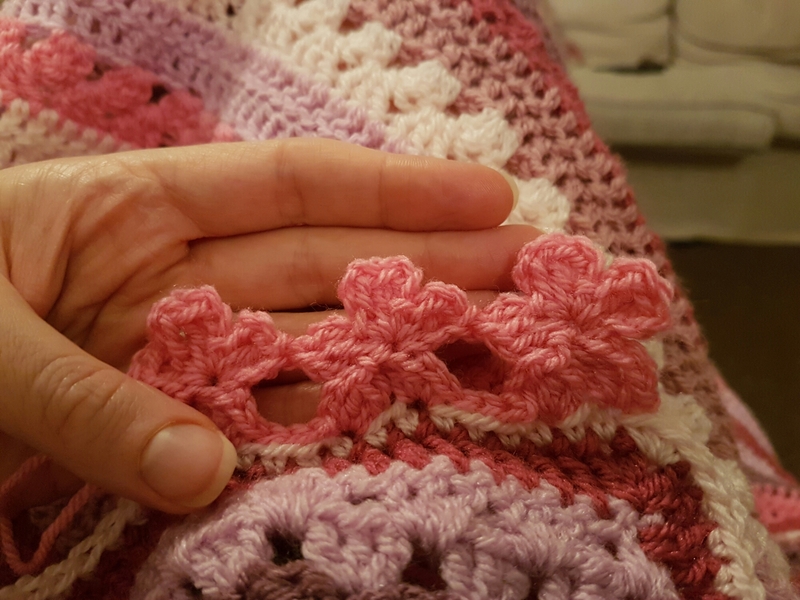 However the flowers were bunched up making a frilly edging that looks beautiful on the lady’s basket in the video but just didn’t feel right for my blanket. 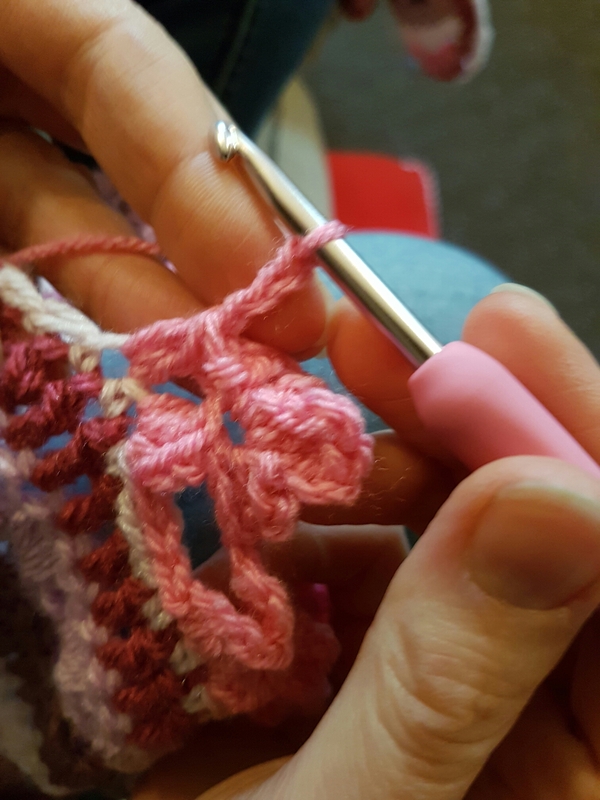 So I changed up the pattern. My photos begin on flower four because that’s when I decided to make this tutorial for you guys but it’s the same whichever flower you begin with. 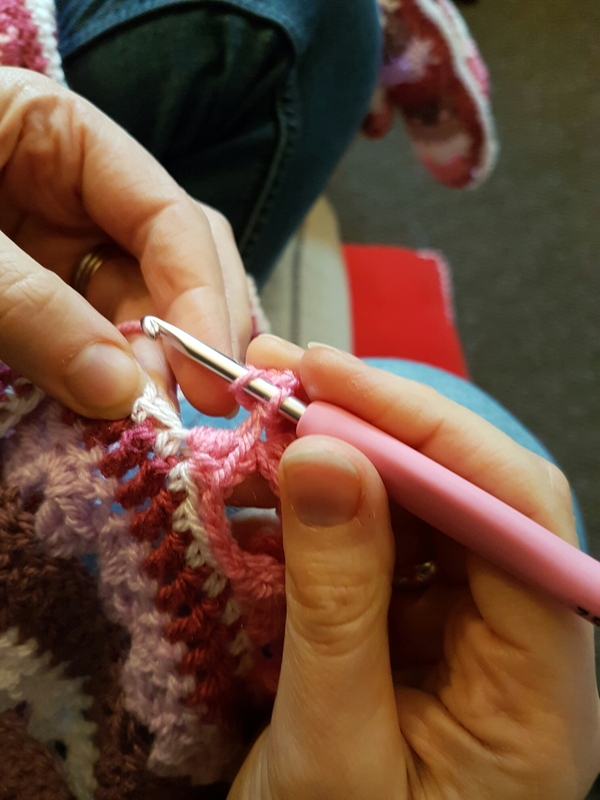 Next, you want to put a two-treble cluster in that same stitch. 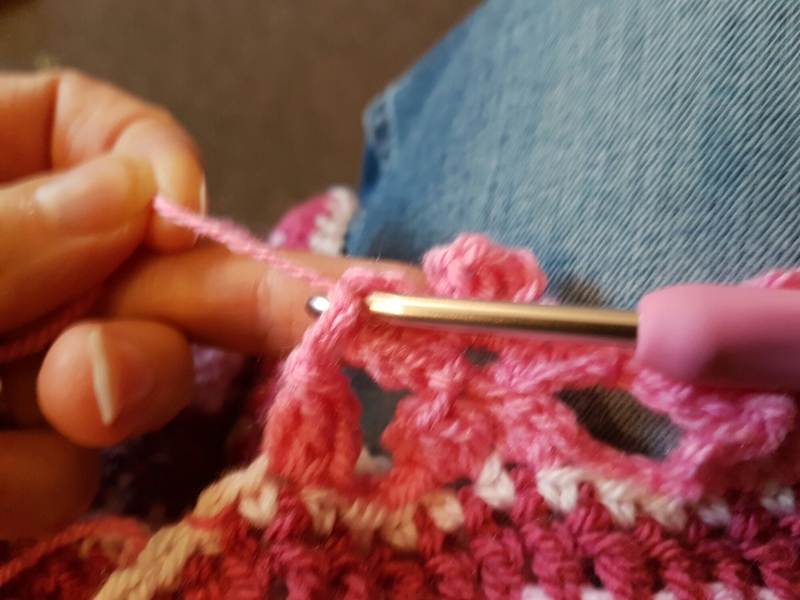 So in the picture above I have my chain 3 on my hook and have done a treble cluster into the same stitch. 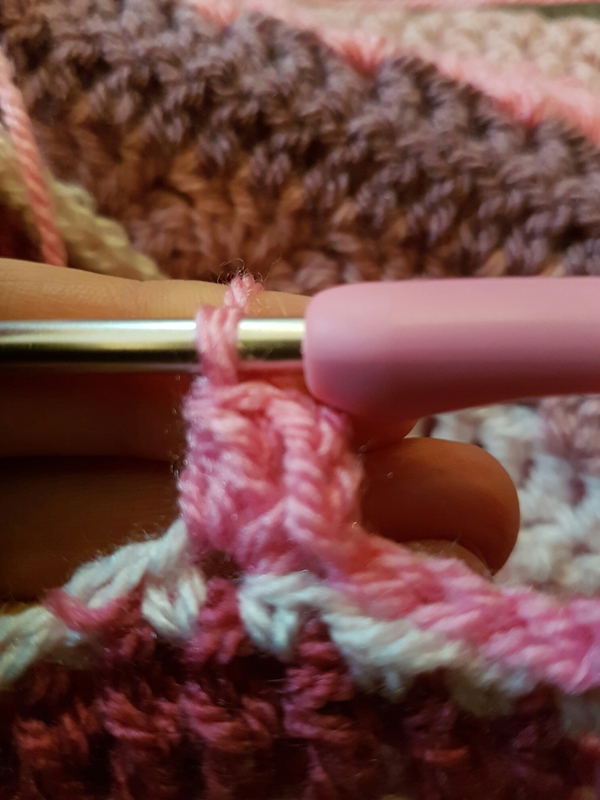 I have three loops on my hook. 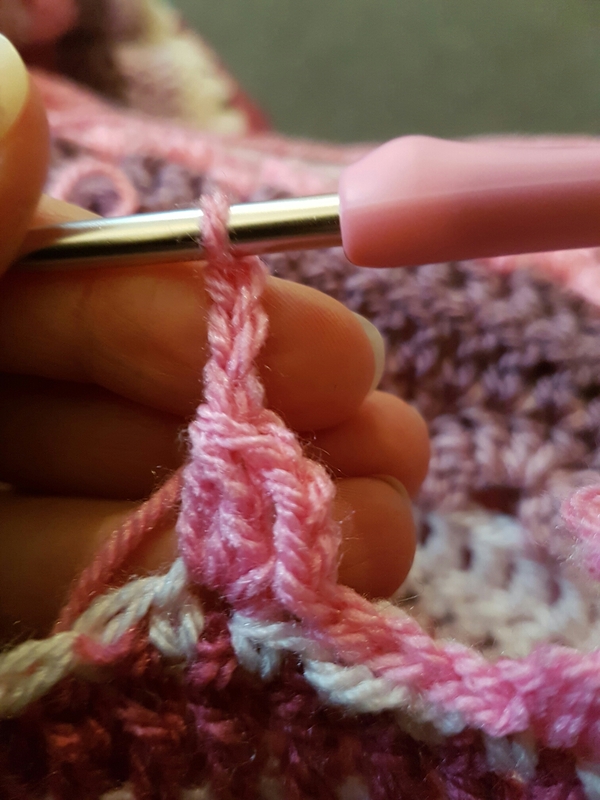 Yarn over and pull through all three loops leaving one loop on your hook. 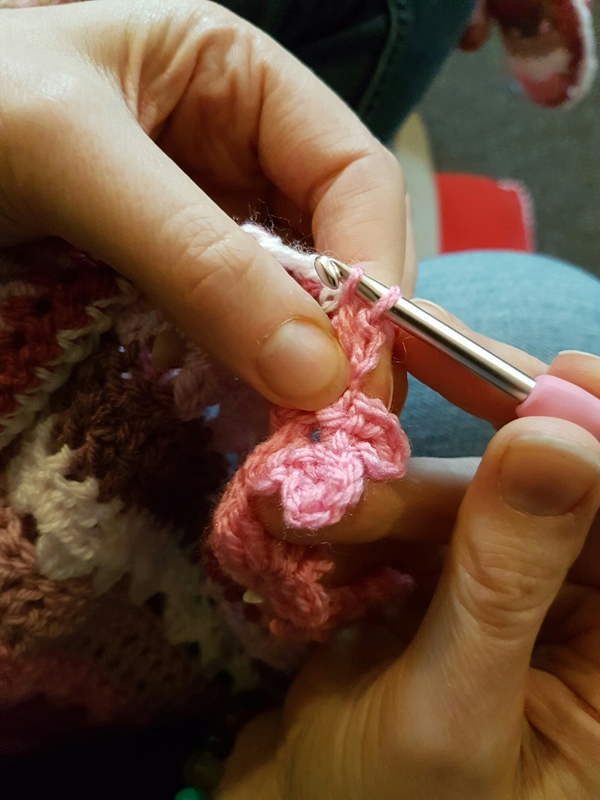 If this is the first flower that you have made just continue to make your petal but if it is a subsequent flower then you need to link this petal to the last flower to create a bit of stability. See? My top loop has stretched here but you can see I’m sort of leaning my chain over to the petal from the last flower. 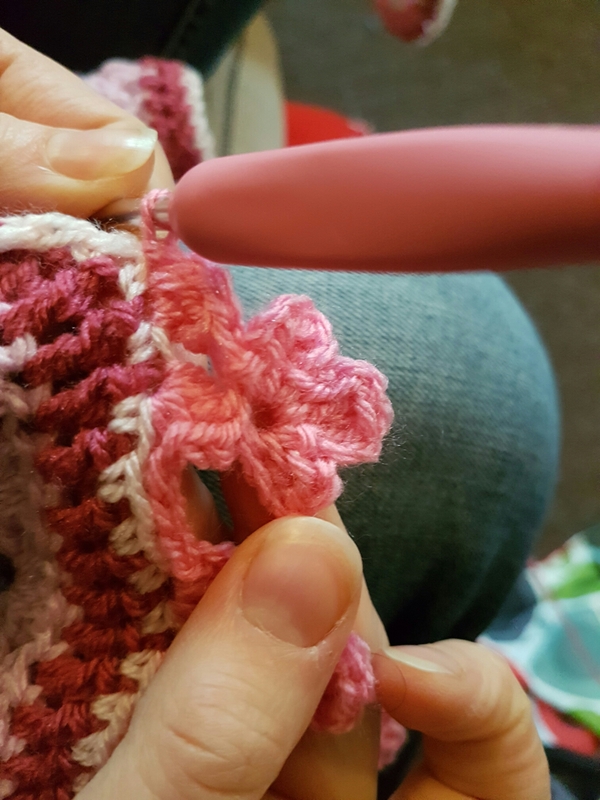 You want to slip stitch the top of the chain to the middle stitch of that petal. 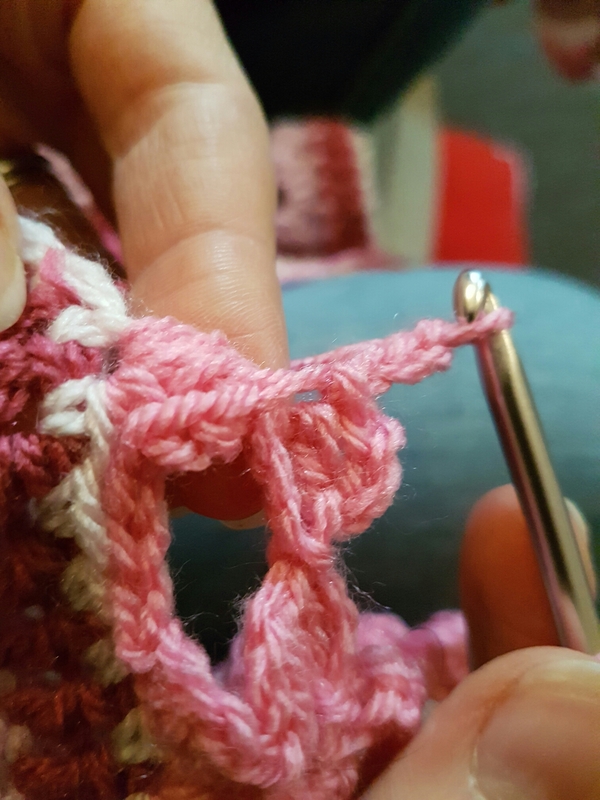 Now it’s difficult to see in the picture above but you need to find the bottom of your chain 3 and make a treble in that stitch. I’ve turned my work to try to show you more clearly: there’s now the chain one safely secured at the top to the last petal, a treble and a chain 3. 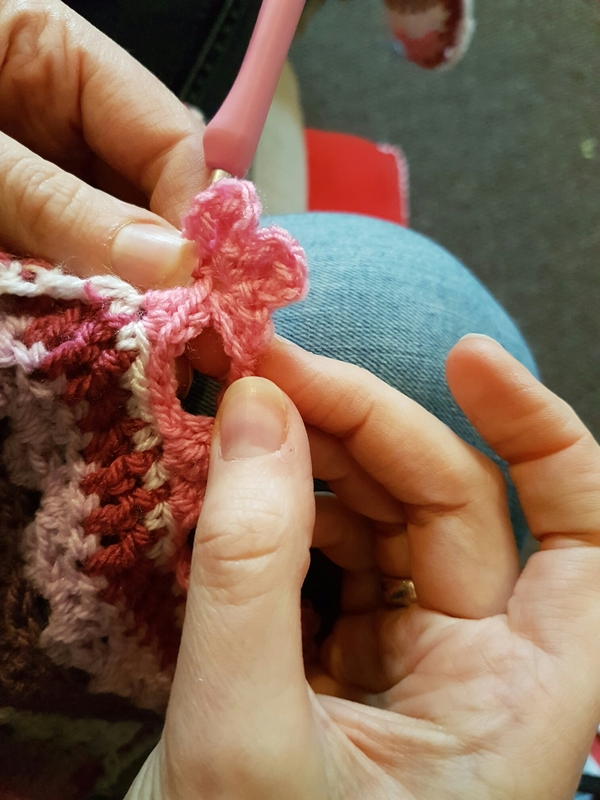 Secure your chain 3 with a slip stitch in that centre hole. 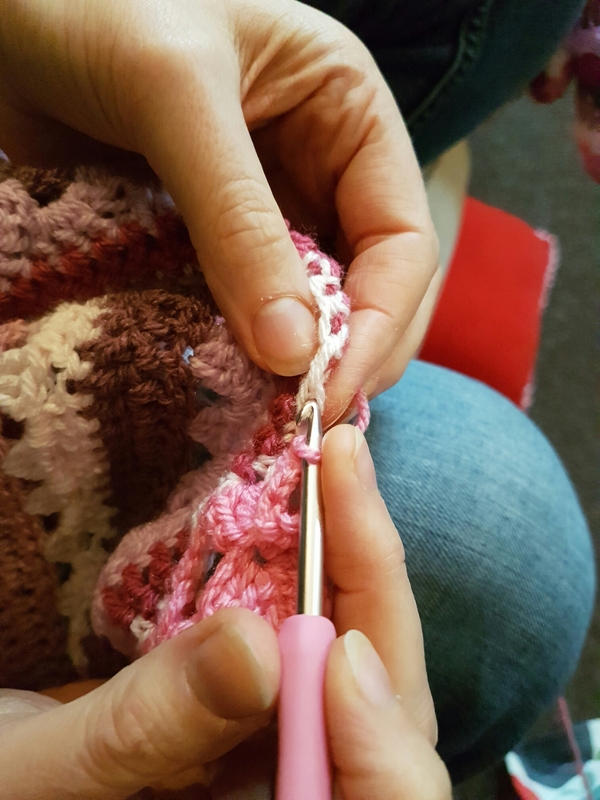 Chain 3 as picture above, treble in centre hole, chain 3 again and secure with slip stitch through centre hole. Repeat one more time. 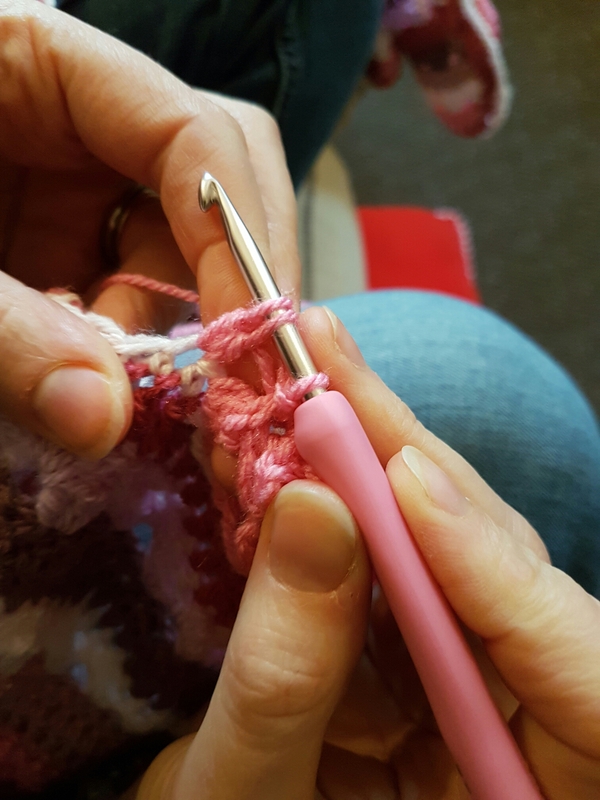 You should now have a petal on your edging, one attached to the last flower, one at the top and one on the left (which will later be linked to your next flower). You now need to create your last petal. 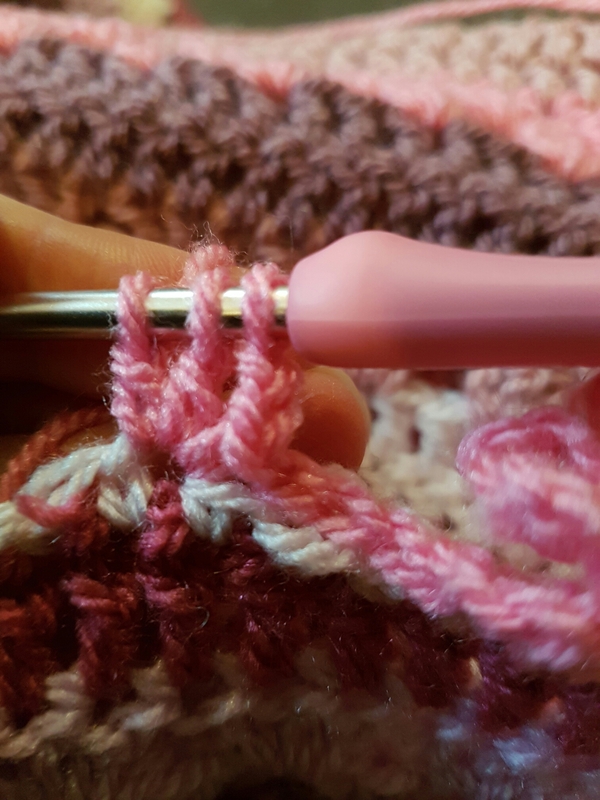 Secure the chain three into the same stitch at the base of your treble cluster. You will find that at this point your petal is leaning drunkenly to one side. 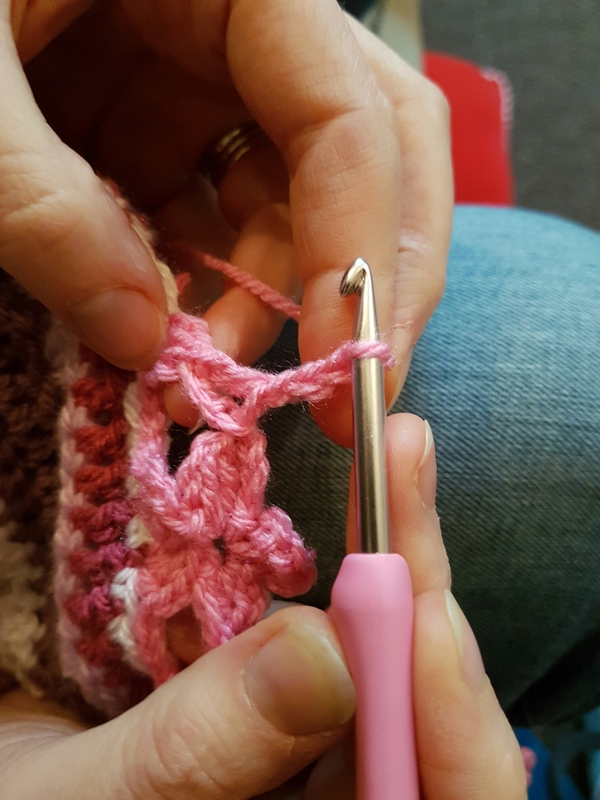 It’s OK, once you make your next flower and the drunken flower is linked to it it will straighten up. 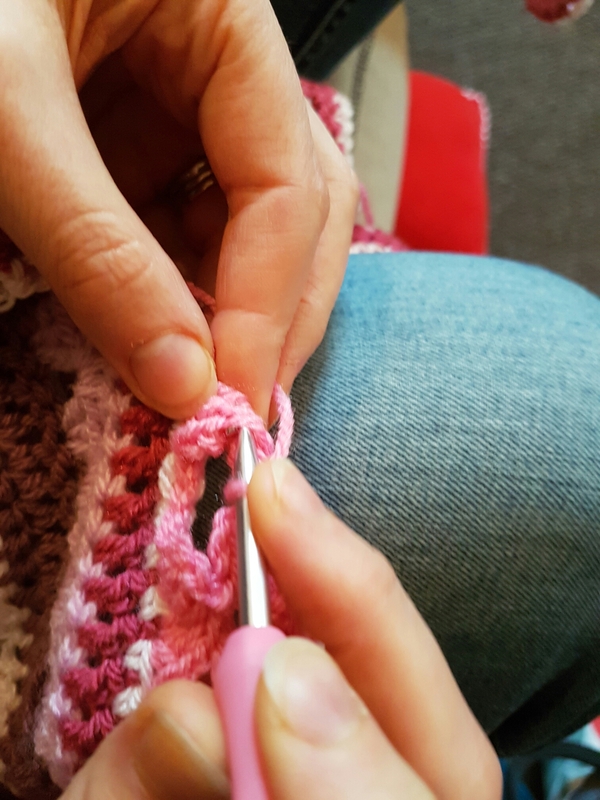 So make a slip stitch in each one of your next three stitches using the back loop only. You are now ready to begin your next flower! I hope this little tutorial is clear, it’s the first one I’ve ever done. Any questions just ask!